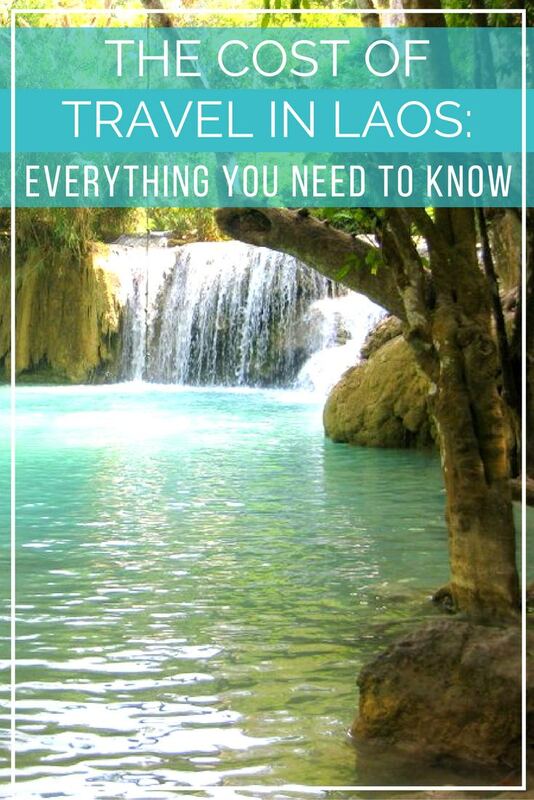 Laos is somewhat of a ‘hidden gem’ when it comes to South East Asia. We were genuinely surprised by this lush, heavily forested country sitting quietly at the heart of the region just waiting to be discovered. Unfortunately, we were equally surprised by how expensive we found Laos to be, particularly in comparison to the hugely affordable countries of Thailand to the west and Vietnam to the east. Laos is a relatively poor country which relies heavily on imports and therefore things can appear more expensive than you might expect for South East Asia. So to help you get planning for travel in Laos we have compiled a rough guide to the daily costs you’ll encounter. We hope this gives you a few pointers of what to expect so you can plan your trip better and get great value from your visit. Related: How Much Will Southeast Asia Cost? Laos uses the Laotian Kip or LAK. You’ll get around 8,000 to $1 US Dollar so you can easily become a millionaire at the ATM. All prices listed below are in US Dollars for an easy comparison. As Laos is still very much in the early stages of embracing visitors, the range of accommodation can be quite limited outside of the larger towns and cities. For a double room with air conditioning in a guest house or hotel we paid between $15 and $32 / night across our two-week trip in Laos. You can find private rooms for closer to $5 (possibly less) if you go for a fan option instead of air conditioning. Dorm rooms will be even cheaper depending on the number of beds and location of the hostel, starting at around $2-3 and up. 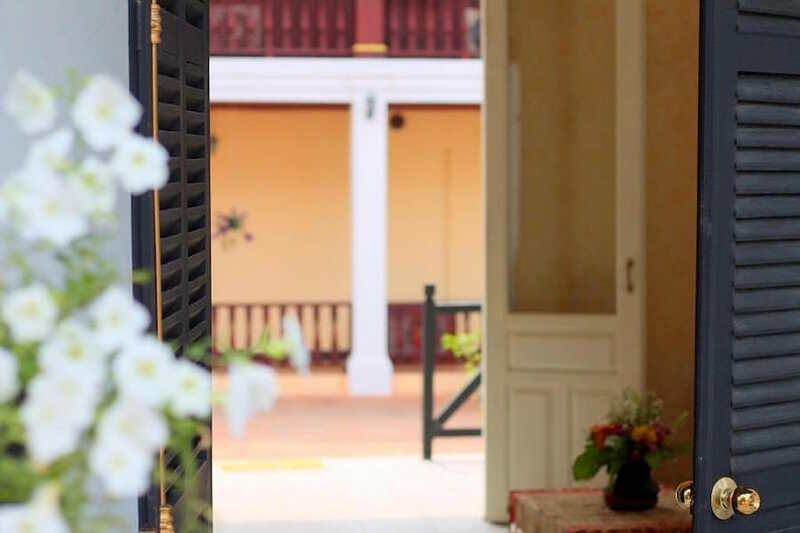 If you want to go for something a bit more high-end, then look for hotels in picturesque Luang Prabang or Vientiane. If you crave a bit of luxury you’ll find rooms for $200+ per night in a private resort. 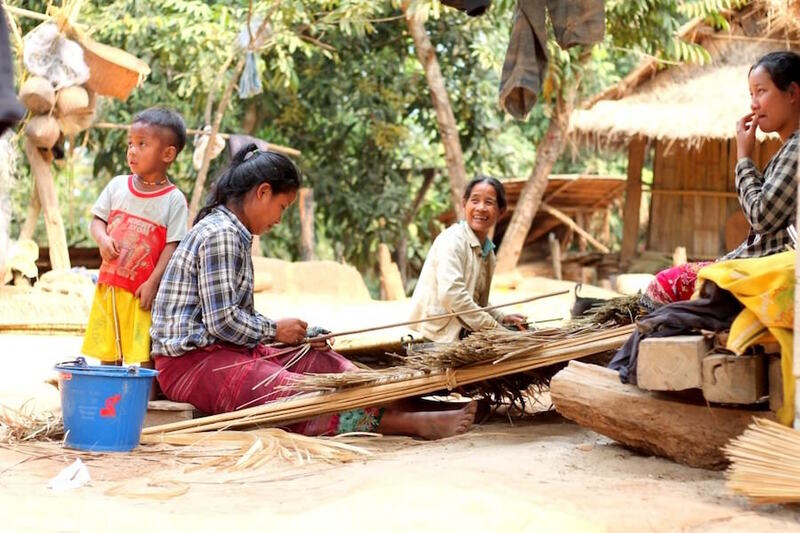 If you are venturing out into the countryside then consider investigating a homestay with locals to get the true Laotian experience. This is a great way of contributing directly to the economy of the village or ethnic tribe. If you can book yourself in directly with the homestay then it can be as little as $10 per night for food, drink and accommodation depending on location. Don’t forget to also factor in transport to reach your homestay. If you organise a homestay through an agent or tour company then the price will start from $20 per night depending on the activities and locations visited. There are no railways in Laos, so buses and minivans are used to get between villages and towns. Over longer distances you can get night buses as well as daytime journeys, which helps to save on accommodation costs. As an example, the bus from Luang Prabang to Vientiane takes around 10 hours and ranges from $10 to $20 depending on the company you use. The government-run bus service can be cheaper but is best avoided due to regular breakdowns and delays. Many of the towns in Laos are small enough to walk around but there’s a trend for placing the bus station a few kilometers outside of town so you’ll need to take a Tuk tuk or taxi in. If you meet fellow travellers on the bus journey make sure you share a Tuk tuk and haggle the cost down as a group to get the best deal – and always agree the price before you get in. The first price quoted is usually twice what it should be so smile and stand firm. 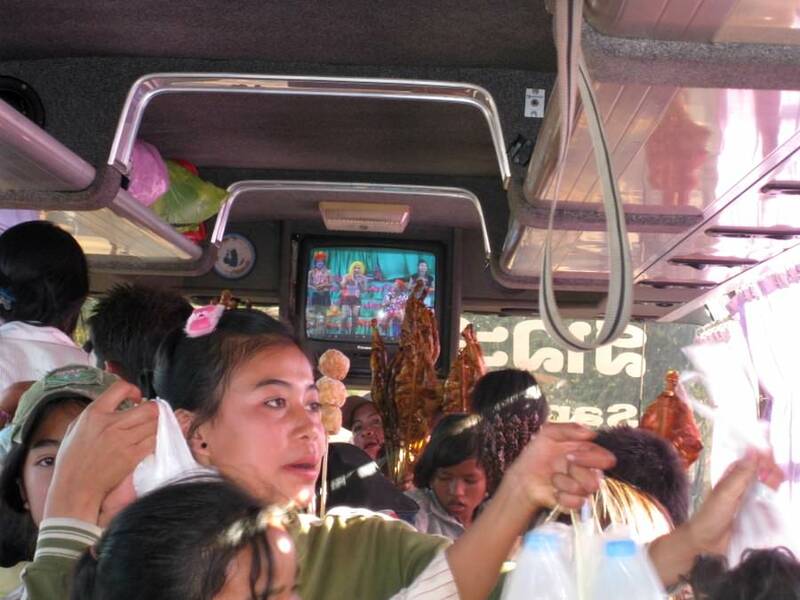 You’ll never go hungry on a bus journey in Laos! In the capital, Vientiane, there’s always a Jumbo (think slightly larger version of a Tuk tuk) or similar on hand to save your legs if you’re travelling further. They should cost no more than $2-3 per journey, and again, agree that price before you hop in. However the streets are fairly quiet compared to many cities and it’s nice to hire a bicycle to go exploring. There are international airports in Luang Prabang and Vientiane with regular flights to neighbouring countries from the budget carriers AirAsia and Lao Airlines. Great street food can be harder to come by than in neighbouring countries and comparatively costs more with full meals starting at around $3 and up. Due to the French influence you’ll find many bakeries offering filled baguettes and pastries from around $2-3. 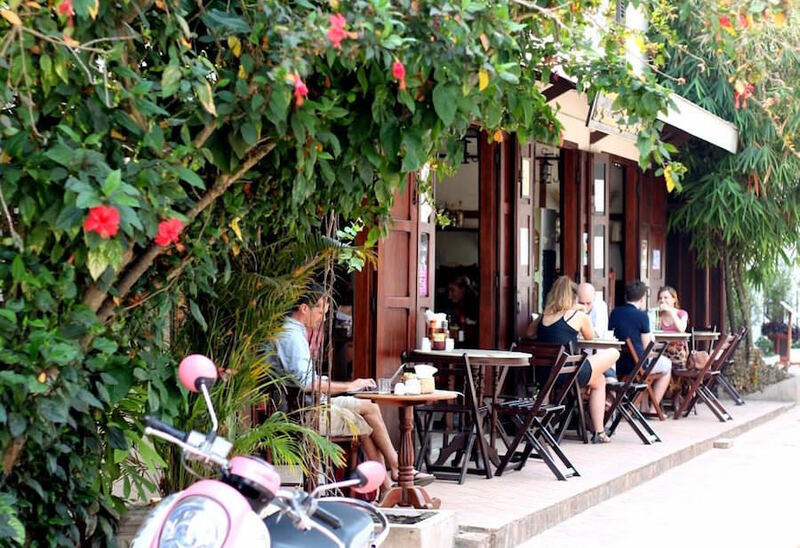 Sit down meals and restaurants range greatly with some great French and Indian options available in the tourist hotspots of Luang Prabang and Vientiane. Prices start at around $6 per dish with drinks starting at $1-2 in more touristy places. Beer Lao is the national beer and a large bottle can start from just $1! Also don’t forget to try some home-brewed Whisky Lao. Although technically illegal to sell, you’ll find it everywhere and we purchased a whole bottle for just $1.50. It’s an acquired taste but certainly hits the mark. We took the posh ‘slow boat’ option for a 2 day trip on the Mekong River and loved it. It set us back $150 per person and included all food, drink and accommodation. You can take the ‘public’ slow boat for 1,2, or 3 days which starts at around $30 per person. The much praised Gibbon Experience in the north of Laos starts from around $100 per day depending on the season. Entrance to parks, waterfalls and temples ranges from $4 to $8. The cost of a visa on arrival starts at $30 depending on your passport. Some countries are charged more, for example Canada, which tops the list at $42 per visa. Sorry Goats! Hi! Your blog is very cool! Just thought I’d comment because I found Laos to be pretty comparable budget-wise to other SE Asian countries if not cheaper – I didn’t think you outlined many costs that sounded more than others, so which expenses did you find to be ‘surprisingly expensive’? Just curious! 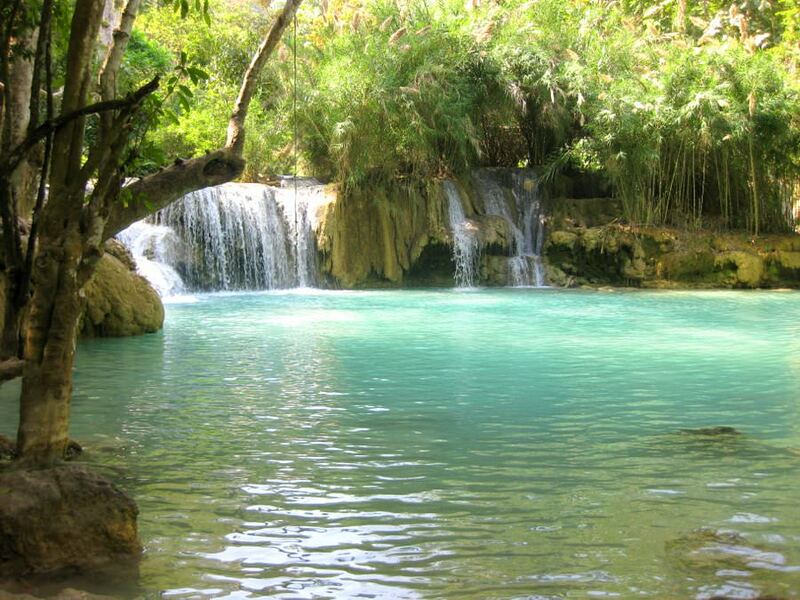 So Laos seems like a fairly economical country to visit. Reminds me of what I imagine parts of Asia would have been like before they became so well-touristed. Very useful and informative post! Really love your pictures of this great country! 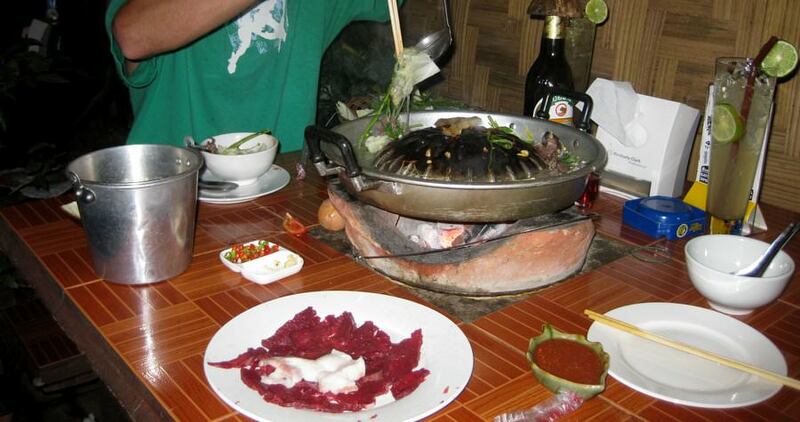 Laos is the only landlocked country in SEA, so it has many difficulties in trading. Although the expense of a trip to Laos is much expensive than Thailand or Vietnam, it still deserved to be explored more. I love jungle forests of Laos. Thank you for the article, very nice! To change cash, there is a new mobile application Fairswap. Broadly, we can exchange & convert cash currency in real-time by meeting with each other at a pre-agreed location. I will try it to find some kip before travelling or get rid of some leftover after holidays.